Youth coach Slawek Morawski is mostly known for his work at “Mindfotballness“: Regularly, videos are published on his twitter- and facebook-channels where he presents very detailed analyses of certain games or single players. When we saw him highlighting glimpses over the shoulder and players “scanning“ the field, we wondered about the difference between gut instincts and intelligence and even came up with many more questions. Talentkritiker: Hi Slawek, your analytical work follows – as you also show on your social media channels – a six-step scheme that combines perception, analysis, decision making, execution, adaptation and assessment of efficiency. 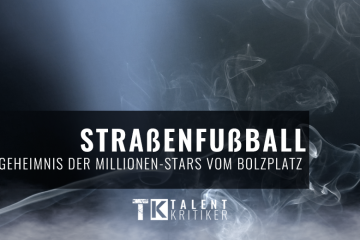 In September, Martin Weddemann, who owns “FOCUS ON PERFORMANCE“, stated in an interview with TALENTKRITIKER: “As far as we know, the brain directs itself to the following pattern: input, interpretation, decision, output.“ Does being a good footballer also mean that you are a good analyst? Slawek Morawski: In my opinion, definitely yes. As a coach, I want my players to be fully aware of the process that precedes every performance on the pitch. Which information is the most important at the moment? How can we gain them and under what conditions shouldthey be interpretated, how do we decide? How do we select information about the ball, opponent, space, and teammates? How do we behave in connection to them? Young players should be good analysts, but their process of analysis must be more dynamic, confident, and they should be very flexible to react quickly if their interpretation were wrong. At least, we have to make mistakes to learn and grow. I don’t work to turn my players necessarily into good analysts at all costs, but I want to give them the tools, which will make them more aware, capable of use their intelligence and, since I work with youths – more responsible. The psychologist Gerd Gigerenzer once declared in one of his publications: “We imagine intelligence as a conscious, deliberate activity that is defined by the laws of logic. But the major part of our mental life is happening unconscious and relies on processes which have nothing common with logic: gut instincts and intuition.“ Does Sergio Busquets simply have a better gut instinct than any average midfielder, or is he really more intelligent? I agree with this sentence; in my personal opinion, however, it fits our daily life better. On the pitch, I perceive Busquets as a very intelligent player. One of the most intelligent. He certainly knows when, where and how to behave during the game. He is neither the fastest nor strongest players at his position, but his cognitive process of gaining, selecting and interpreting information is top-class. Difference is really important – Busquets is not only looking, but tries to see, to notice and to know. That’s why he can clearly decide and perform. It’s great to watch him play. How would you characterize the relation between intelligence and gut instincts on the football pitch? Both must be directed into the consciousness. You have to support the judgement process and build up an awareness that is above all decisions and actions. Sometimes players use their intelligence, sometimes a thing you might want to call „subconsciousness” gives them a signal from gut instincts. Both are needed but personally, I work with my players to develop their unconscious – consciousness. On the pitch, they don’t have time to judge which signals come into their mind and where they come from. They must be confident, aware, and unite thinking and feeling in what they are doing. How does that affect you work as an analyst – especially if you reach a point where you have to rate a player’s game intelligence? I am certainly not an analyst. I’m a coach who uses his own analyses during coaching processes. Analyses are the best way to give my players a feedback or good examples of specific behaviours. I don’t want them to simply copy. The most interesting work starts when my players must understand some problems that occur during the game and try to find solutions on their own. I will never tell them to solve something in the same way player X or player Y does it. Rating a player’s intelligence is just additional information for myself and I don’t want to work In a way that someone must change something merely because it’s too ill developed. Rather, I prefer to cooperate with them to find the best solution to a specific situation. Every player is different and that’s the reason why I love to work on this area of football. Let’s work together to understand a specific problem and we will find out where this journey will lead us. Let’s watch analyses but don’t copy anything. Player must decide for themselves which conclusions they can draw, and how to change their habits. As a coach, do you think it might not be the best idea to bother players, who mainly follow their gut instincts on the pitch, with complex tactical issues? 1899 Hoffenheim’s Nadiem Amiri for example, who is a great decision maker, might be not the greatest thinker. He once admitted that his coach Julian Nagelsmann actually knows him better than he knows himself. How can a coach influence player’s decision making, positively as well as negatively? It depends. As a coach, I can only judge if my player is making decisions by habit, or through aware cognitive processes. That’s all. If habitual decision is consistent with the philosophy and style we want to express during the game – it may be okay. But still, there are no habits that should play a crucial role on the tactical side of the game, awareness and rational judgements should take over there. In the end, it all depends on consistency between the player’s personal decisions, and style that team wants to stand for. In youth football, however, I personally always prefer and demand creativity and awareness in a player’s decision-making – not habits. When we talk about practice and experience: Can a young player or a player who returns from an injury/a role as a reservist show the same performance as a player who is full of sap? According to you, Moussa Dembélé‘ played such a crucial role in the 3:1 win against Dortmund at the beginning of this year’s Champions League season because he occupied spaces almost perfectly – and he barely missed a game at Tottenham during the past two years. In my personal opinion, it all depends on training conditions. Even with my youth team, I always like to repeat – the way you work and train is the best way you to influence how you’ll play . Every behaviour, action, and training content should be practiced in conditions that are most similar to in-match conditions. Matching these is the best method for improvement. The first step of your scheme is “perception“. The great Rene Maric once reasoned in an article on Spielverlagerung.de: “In the next years, it will be decisive how academies of all countries are educating their players in individual tactics. The glimpse over the shoulder and intelligent cognition of the information with the correct rating of the information in the strategic-tactical context are here one of the most important categories of the education.“ Will “seers“ have a bigger impact on the game than they are having now? They already have crucial impact on the game. The thing is that their effort is not as easily noticeable as spectacular dribblings, fast runs, and powerful shots. But their presence on the field can be decisivie. Iniesta, Eriksen, Xavi Hernandez, Fabregas or Pirlo, without a doubt are top-level players even if they are neither the fastest, strongest nor are they scoring many individual goals. But they have brought, and continue to make a big difference almost every time they play. It’s because they know how, where, when, and what to do depending on outside conditions and its judgement. I really hope that these players will be replaced worthily by next generations. However, we must separate aspects of LOOKING AT SOMETHING, and SEEING, NOTICING SOMETHING. Many coaches are happy when their players are „scanning” over their shoulder, but we shouldn’t forget that it is more important to see, recognise, and analyse what to do in connection to what has already been seen. Let’s move a little closer to the pitch. It’s in the geometric nature of the game that you have potentially more direct influence on what’s happening when you’re standing in the center of the pitch than when you’re standing at its fringes. Before a game: Do you talk to your left back the same way you talk to your central midfielder? Modern football is too dynamic, demands players that are flexible and prepared to switch positions more fluently. Let’s look at the example of Kyle Walker and Fabian Delph at Manchester City or Philipp Lahm at Bayern Munich under Pep Guardiola. Fullbacks that can play comfortably in the center of the field. Player’s body orientation, ability to „scan” the field in order to get information of what’s happening around you – to reduce your blind zone, those are the things that allow player to play smart on every position on the field. So yes, Since I work in youth football, I talk to them the same way, except for sharing individual fundamentals per position. The concept is the same, we want to have the ball, play creative football, and cooperate as a team. How long does it take until a player is mature enough to be specialized for a certain position in your opinion? Specialization is a specific training phase which occurs when a player is between 15-16 years old, depending on individual development of the player. Before that phase, players are training mostly on one, two positions without the pressure to specialize. Individual and collective training contents are provoking players to find solutions for the problems they face: playing on specific position, even when we work on some specific positions during our sessions. Even when there are players that are not necessarily connected to a certain position, they are working very ambitiously. Philipp Lahm was having some excellent games as a central midfielder under Pep Guardiola – after playing the right back position for years. How do you help a player rethinking his view on the game? Can you help him with the same tools which you are using as an analyst? I will rather put it this way: analysis is one of the tools to make my coaching work more complex. It’s a holistic, balanced process of preparation, work, analysis, assessment, feedback, correction. Video analysis is one of the best tools in modern football that can provide great examples for a player and opportunities to help him make his own conclusions about his performance. If we connect a player’s self-analysis with the analysis of a coach during the training process, we can make this process more complex. Perceive, analyse, be aware and improve together – as coach and player. As a last point: Who is your favorite “intelligent seer“ currently and of all times?